Note that most of these genes increase the risk of calcium oxalate kidney stones, but some just increase the risk of kidney stones in general (not specific to oxalates). The disease associated with a more serious metabolic defect that causes too many oxalates to build up in the kidneys is called hyperoxaluria. It is caused by a deficiency in alanine-glyoxylate aminotransferase which can be caused by polymorphisms in several genes. [ref] There are three types of primary hyperoxaluria. A/GXT (alanine-glyoxylate aminotransferase) is a gene that codes for an enzyme found in the liver. It helps convert a form of oxalate made by the body (glyoxylate) into glycine. Insufficient enzyme production leads to too much oxalate for the kidneys to clear. Primary Hyperoxaluria Type 1 is the name of the kidney disease caused by calcium oxalate deposition. [ref][ref] Note that only a few of the many genetic mutations associated with hyperoxaluria are not sequenced by 23andMe. 23andMe SNPs for hyperoxaluria include i5012629 and i5012628 on the GRHPR gene. 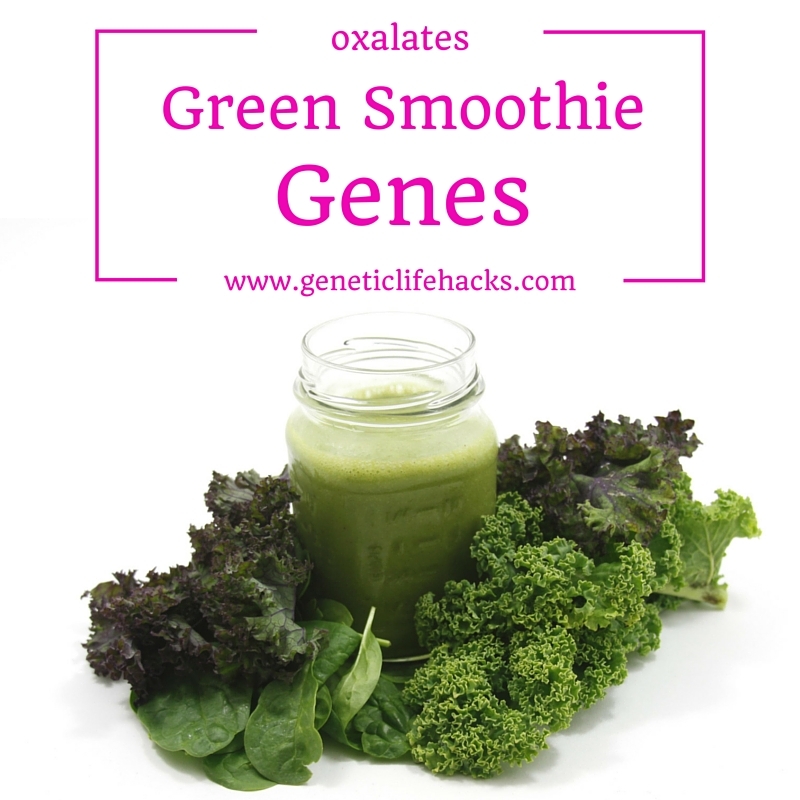 If you carry one of the pathogenic hyperoxaluria genetic variants, you should probably talk with your doctor and consider adopting a low oxalate diet. Your gut microbiome plays a big role in oxalate metabolism as well. Oxalabacter formagenesis is a gut microbe that breaks down oxalates from our diet. The presence of this bacteria reduces the risk of oxalate based kidney stones by 70%. [ref] Ubiome’s gut microbiome sequencing can tell you if you carry oxalabacter formageneis, but I don’t know that there is anything you can do about it if you don’t have the bacteria in your gut. There aren’t any probiotics (so far) that contain it. Vitamin B6 (as the active form, P5P) may be helpful in preventing kidney stones if you carry the genetic variants linked to primary hyperoxaluria. There have been several studies as well as one clinical trial showing the effectiveness. [ref][ref] You can get the P5P form as a supplement most place including on Amazon. An article that ties together Hashimotos with oxalates: Are Oxalates the Root Cause of Your Thyroid Issue? Debbie, I checked my I5012629 and it is AAGT / AAGT. How it corresponds to “I5012629 (DD is Primary Hyperoxaluria type 2, DI is carrier of allele) I is normal.” ? AAGT would correspond to the I – insertion (normal). Thanks for letting me know that you see your results that way. I’ll add in a note about it on the blog page! Is fasting right for your genes?